I really haven't been everywhere, but lately I've been realizing how lucky I am I have traveled as much as I have. While most of my international trips happened before I turned 12, I've been able to go a lot of places over the past few years. From drives to common places but through new areas to little work trips to family visits, we've been all over the US. Teemo, my little travel buddy, has been to thirteen different states, and has been in doggie day camp in five of those. 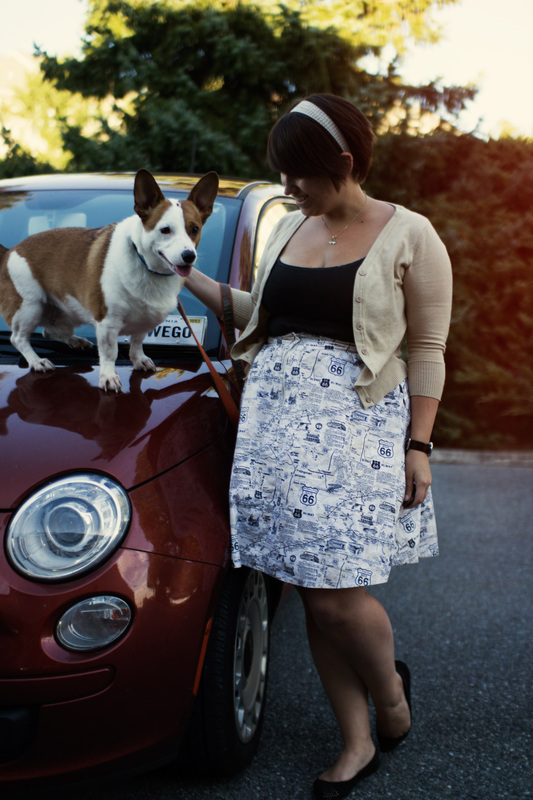 Seeing that a lot of animals won't go near the car or really cannot handle it, I think I found my match with this little corgi guy. PS. This weird license plate thing I've been carrying in my posts is indeed a clutch. I got super lucky with a Kate Spade secret sale. It felt too 'me' not to get it. You look stunning, the skirt is genius ! I've been eyeing that Kate Spade clutch forever! You look adorable. This clutch IS totally you and I love it! Teemo looks like such a trooper traveler. I also love your skirt! Aww Teemo. My dog used to like taking trips in the car too. He was such a good dog. It's always great when your dog can come along with you. I love love love this skirt you're wearing. The print is seriously awesome. 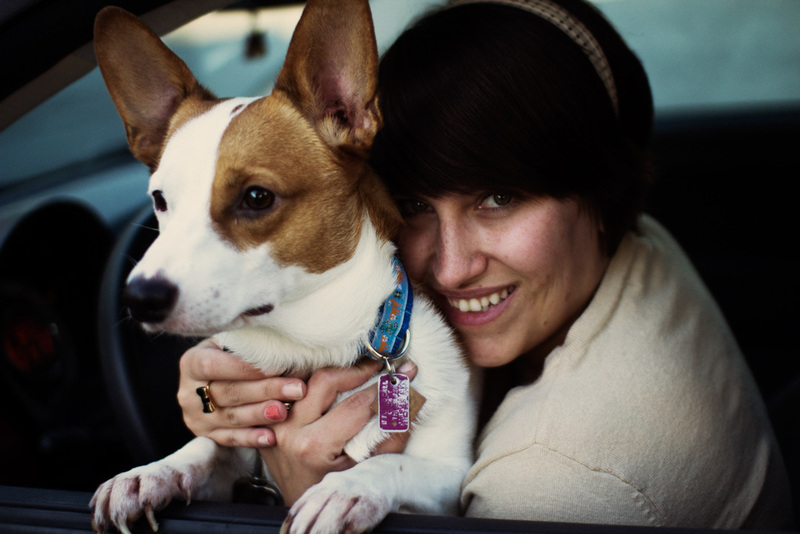 These pictures with Teemo turned out so adorable too. I love the one with him on the hood of the car. That skirt and clutch are such a great pairing! It's always great to be able to travel. One of my goals is to visit every state before I die. I think I've been to about 11 so far! Slowly, but surely....lol. OMG Teemo is looking even more photogenic than usual. That skirt is pretty cool too. His nails do look long here, but assure you we keep them trim. You will note his paws are very red and raw, he actually has terrible allergies or something and has been going to the vet on and off, his fur is a bit scare there now making his nail beds seem long, even though his nails right now are up against the quick. Poor bud is in a cone while he heals, except for walks and food. Poor Teemo :(, I'm glad you look after him so well. He's lucky guy to live with you :). He actually poses like a dog model ;) My corgi's always run away from the camera or they look frightened on pictures while they'r such a cheerful pups! The road map skirt is adorable! And I love the photo of both of you in the car window. 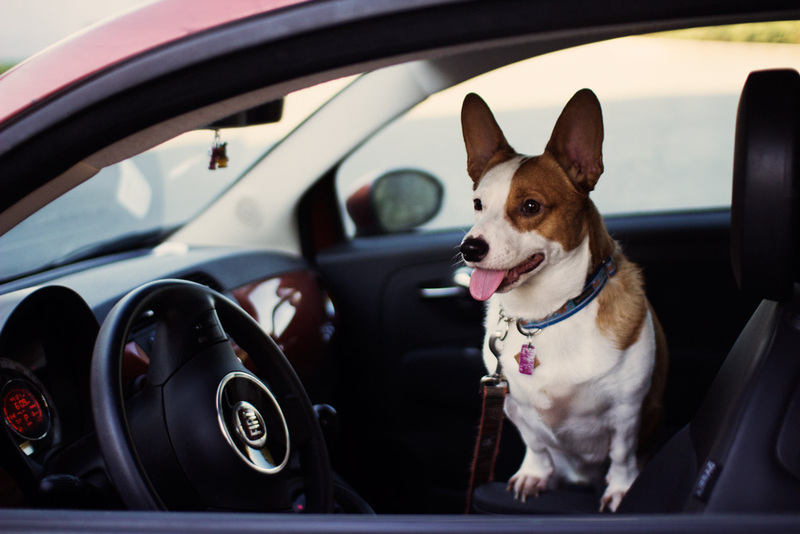 I feel so lucky that Sherman (my dog) loves the car as well. The Skirt! The clutch! I LOVE IT ALL. You look AMAZING. it's my dream, too! to take piri to different states. he's getting a bit older so it's getting a little harder for him, but i really want to show him as much as i can. we have a road trip to utah or colorado or arizona to see the beautiful deserts. hope it can really happen. i love that piri is so good in the car. he mostly sleeps now but doesn't make a fuss at all. i love all these pictures. and i love you and teemo together. such a cute duo! That clutch is VERY you and goes perfectly with that skirt! yay! this is so gorgeous! Look at your little pup in that last photo! Oh my gosh, SO cute. Aw, you lucky gal! I haven't been able to do much travelling other than I guess our family's "usual" spots--Montana or North Dakota, in order to see our relatives. Don't get me wrong, I love travelling there, but one day I would just looooove to be able to travel out of the country to say, Ireland or Scotland or the Netherlands! *____* ehehe, one day. Even in the US there are places I want to see like Nevada and Maryland and lots of places now that I think about it. Yeah, this is the cutest travel-themed outfit ever. 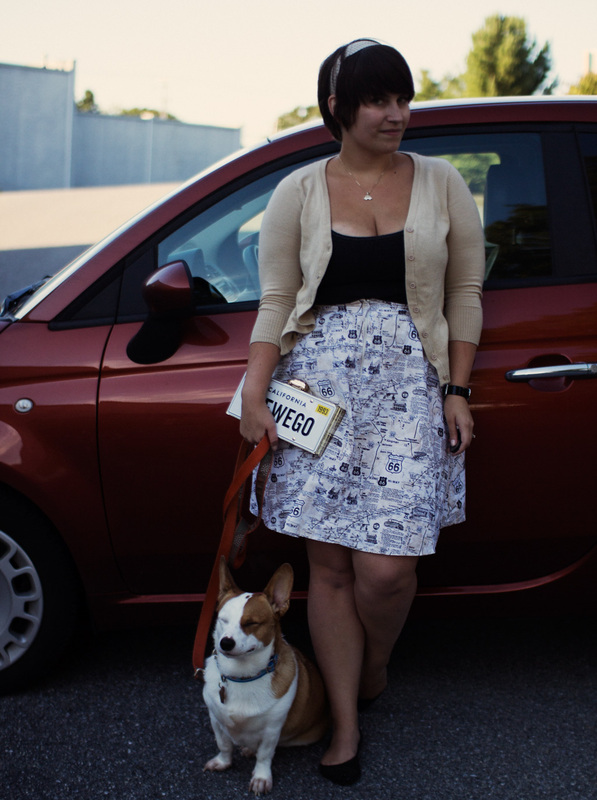 I love that print on your skirt and the clutch is just the perfect partner for it! What a cute travel partner you've got, too! That skirt is so awesome!